Born in Zaragoza in 1983 he starts to play the piano at five years old. After finishing the degree at the professional Music Conservatory of Zaragoza, it is supported in the classroom by pianist and educator Miguel Ituarte in the Higher School of Music of the Basque Country, MUSIKENE, San Sebastian, completing his studies four years later. During his stay in MUSIKENE has studied chamber music with Eva Pereda and contemporary music with Ricardo Descalzo as well as collaborate with the Symphony Orchestra of MUSIKENE being directed by José Luis Estellés. After four years of training with Miguel Ituarte, exceeds in 2007, he is admitted at postgraduate in form of part time, of the Liszt Academy of Music in Budapest, Hungary, and is admitted into the classroom of the prestigious Hungarian pianist and pedagogue Gábor Csalog. He has also received lectures and advice of musicians of the stature of Gustavo Díaz-Jerez, Martha Zabaleta, Miguel Borges, Silvaine Billier, Claudio Martinez-Mehner, Rita Wagner, Eldar Nebolsin or Josep Colom among others; as well as it was selected for participation in the classes Murrai Perahia, Andras Schiff and Grygory Kurtag. In his career has participated in concerts and offered both solo and with different camerísticas and orchestral groupings by Aragonese geography, Teatro Principal of Zaragoza, Eduardo del Pueyo Auditorium from Zaragoza, Zaragoza´s Sástago Palace, Huesca, Monzon recitals… and much of Spain, Madrid, Bilbao, Seville, Valencia, San Sebastian… as well as in France Prioré du mesnil des Arts and Budapest in the Kisterem of the Liszt Academy of Music in Budapest room, Germany, Finland and United Kingdom among other countries. He was also selected for two consecutive years, to participate in the concerts organized by the Spanish Embassy of Hungary, offered in the Budapest Muszeum Irodaly Petófi. Under the auspices of the Government of Aragon, participated, along with other Aragonese, musicians in the recording of a C.D. Regarding with contemporary music, he has premiered several works of the young composer Aragonese Mariano García Cámara, has had the opportunity to play the integral of his work for piano solo, chamber, directed by the composer, piano and Orchestra, directed this last work by Albert Barranco in the Auditorium Eduardo del Pueyo of Zaragoza. He has played with orchestras like the Symphony Orchestra Musikene, Orchestra Contemporary CSMA or Camerata Musicalis among others and has been directed by important musicians as mentioned José Luis Estellés, and Alberto Barranco, and Nacho de Paz or Edgar Martin among others. Interested by the teaching and research fields, he holds a master’s degree in music education techniques and a master in educational research. He also holds a Ph.D. in Education with International Mention University of Zaragoza thanks to his research focused on the study of performance anxiety in University Music Students in Spain. He is permanent member of the research group of the Government of Aragon named Entrepreneurship and Coaching (EC), Personal and professional development. 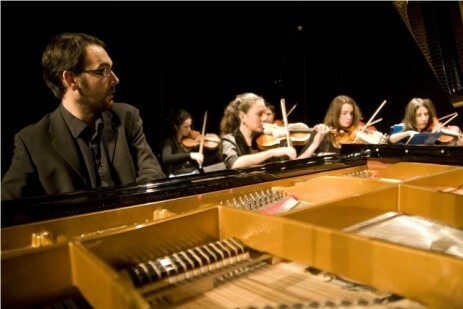 He currently holds a position of associate teacher of Musical, Plastic and Corporal at Zaragoza University.